Sorting your templates for the different sizes circles. Write on each size what colour they should be. Check you have enough paint of each colour. Make up any mixes you need as well as stirring any paints which haven’t been used for a while. Do this early as air bubbles take a lot longer to come out of these thicker paints. 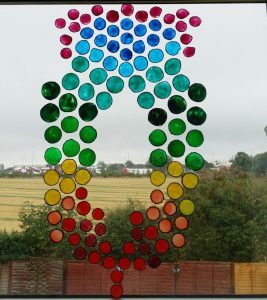 Make a couple of spares of each colour/size circle. Give the paints at least 2 days to dry before you peel them off the first time. Much of this will seem obvious but it is quite easy to get a bit blasé about the preparation especially if you do a lot of glass painting. 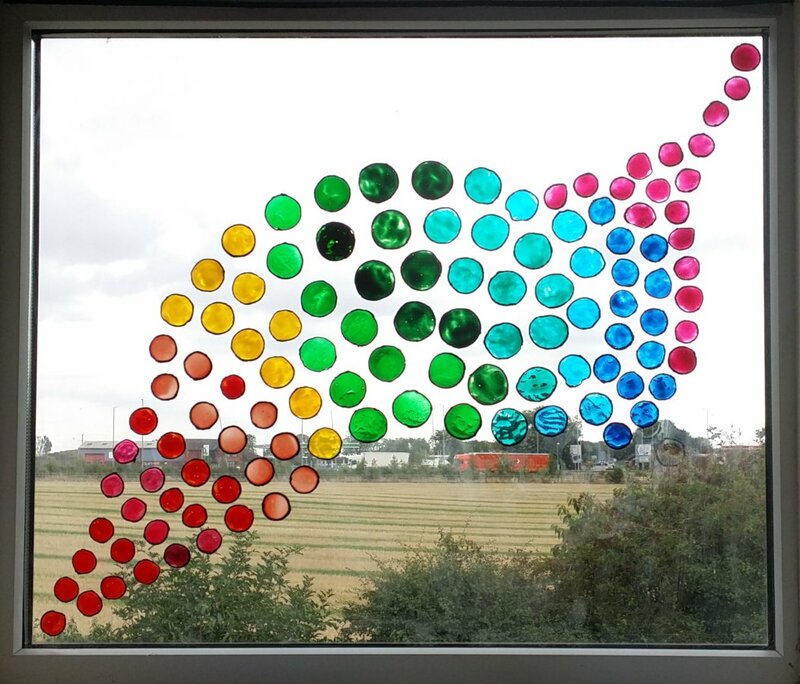 Peelable Glass Paints. (Colours to suite). Folder Pockets (or something else suitable for working on and then peeling the paint off). Your Circle Templates. (or download ours from the Free Designs/Projects section ). The technique is actually quite simple. Put the template and strengthening board inside the folder pocket with the template showing on top. Outline the circles (This is a bit repetitive but good outlining practice.) and leave to dry. Paint the circles. With most peelable glass paint you can use it direct from the tube but you should still use a brush as well. With a brush you can ensure the paint is right up to the outliners, smooth the paint and lift out any air bubbles. Leave the paint to dry. How long this takes will depend on your room temperature and the thickness of the paint. I’d recommend leaving it at least two days as a minimum. Ensure the window is clean. Build up your design a circle at a time, peeling back off and positioning any you are unhappy with. That is basically the complete project. You will notice in the video that I used lots of different types of Peelable Glass Paint: Pebeo, Gallery Glass, Berol, Gas Design and home made. I only did this as these were the paints I had around and I needed a wide range of colours. In retrospect sticking to one or two types would have given a more consistent look to the finished item. Not only can you make your own design in this project, you can also change it when you wish. Have a different piece of art in your window or on your door every week! 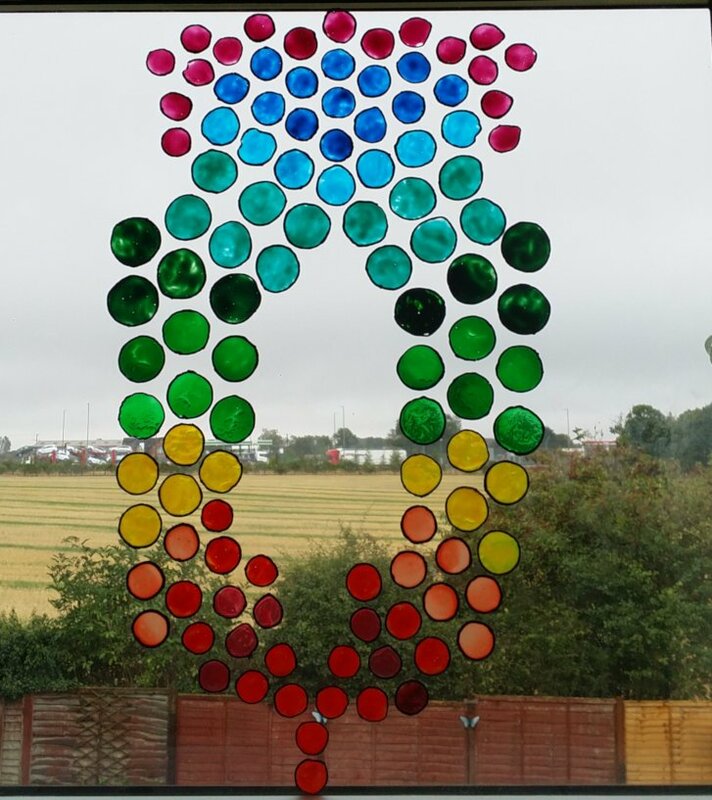 2 Glass Painting Projects and More.